Je vous donne le Ciel pour vos estrenes, SIRE. De l’Enfer odieux, des trois Mondes le pire ? France, as it wants you alone for its King. Of hateful Hell, the worst of the three worlds? Of Kings, whose greatness is like that of the gods. A couple of notes: Pluto was alloted Hades, while Jupiter got the heavens and Neptune the seas to rule. 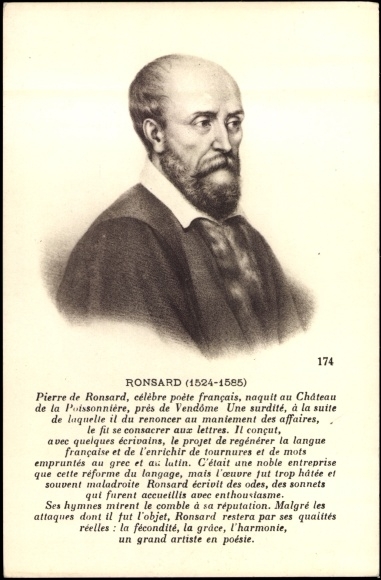 Ronsard alludes to all three in the opening stanzas. In line 10, the ‘eldest child’ is Francis, later Francis II of France briefly, who at the time was King Consort of Scotland through his marriage to Mary, Queen of Scots (there is a beautiful double-portrait in Catherine de Medici’s book of hours.) . His death at the end of 1560 left her (briefly Queen Consort of France) a widow still in her teens, and free to pursue the chaotic course of her Scottish career with Darnley and Bothwell. I have put this in the Sonnets diverses – which is where Blanchemain prints it – though Marty-Laveaux includes it among the various “sonnets retranchées” in his final volume. In book 1, also, Ronsard inserts occasional lyrics which do not conform to sonnet form. This one is a lovely frisky light-hearted one! Le plus secret de l’Eglise. Dedans un cloistre enfermee ? Ton front, ta lèvre jumelle ? T’aura mise en sa nacelle ? Que jadis tu fus m’amie. Ah je meurs ! Ah baise moy ! Ah, Maistresse, approche toy ! Most holy part of the church. A hundred little acts of love under the sheets. Your brow, your twin lips? Has taken you into his little boat? That you were formerly my beloved. Of having been shy with me. I’m dying, so kiss me. Oh Mistress, come near me. Like a quaking fawn you flee. Or farther down still, if may be. in Greek myth, Charon’s boat took the dead across the River Styx to Hades, where Pluto ruled. And there is one minor change later on, where he deletes the “un” in the 3rd line of the last stanza: “Tu fuis comme Fan qui tremble”. It is worth noting that these ‘stanzas’ were imported into ‘Cassandre’ after starting life elsewhere: though Blanchemain includes them there, in his 1560 edition they actually appeared among the Odes!